This is a very simple design, which can also be made longer by only folding in a bit at step 6. For some more elaborate card stands, check out the Origami Ninja Star Card Holder here. You can also use these stands to display photos and any other flat item, credit cards, a unique use would be a little stand to keep sewing needles or safety pins at the ready! You will need just one sheet of paper, for a business card size, use at least 15 x 15 cm paper. If you're using these for a party, check out an ​Origami Cake Box Tutorial, which makes another great decoration. Start with the paper with the color you'd like as the strip that the card fits into. In this case, the bottom strip will be blue. 1. Begin by folding the bottom edge all the way up to the top edge and making a crease in the very center. 3. Fold the right edge all the way over to the left edge but don't make a big crease, just a small pinch mark in the center is enough. This is to avoid an ugly crease in the middle. 4. Now you can fold the left and right edges to the little mark you just made, and then unfold. 5. Flip the paper to the other side. Fold the bottom edge up to the first horizontal crease from the bottom. 6. Flip the paper over to the other side, keeping the folded bottom edge at the bottom. Fold the left and right edges again to the middle. 7. You can see you now have a section at the bottom. 8. Now assemble by inserting the very top into the flap. 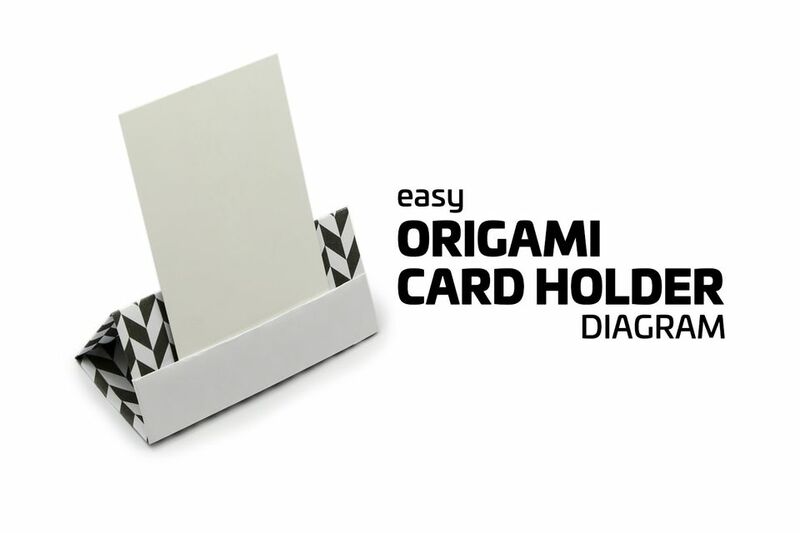 I hope you enjoyed making the origami card holder or stand, and remember, origami takes practice, so each time you make one, it will be better than the last. For more tutorials and also video instructions, check out Paper Kawaii on YouTube.